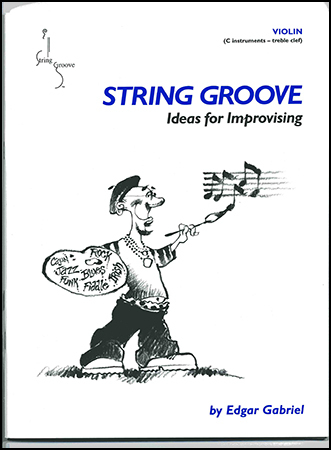 String Groove is for string students, teachers and professionals who want to learn to improvise. It can also work for other musical instruments. If you combine the violin, viola and cello books, each piece can be performed by a trio or larger string ensemble! This system consists of a book and CD of 12 original tunes written in the styles of: Irish Fiddle, Smooth Jazz, Jazz Blues, Rock, Middle-Eastern, Old-time Fiddle, Salsa, Heavy-Metal, Cajun Fiddle, Rock Blues, Swing Jazz, Funk. The 65 minute CD includes two versions of each composition. One version is complete with violinist Edgar Gabriel and the other version is performed by the rhythm section minus violin, so you can play along. After a tune is presented, it is followed up with improvising ideas, scale suggestions, recommended listening for that genre and more! To top it off, there are multiple appendices on the subjects of Intervals, Key signatures, Chords, Swing, and instrument amplification. The viola book includes an additional appendix on playing backgrounds and the cello book includes an additional appendix on bass lines.